After Hina challenges Himegami, he responds by expressing his opinion on Hayate and Nagi. 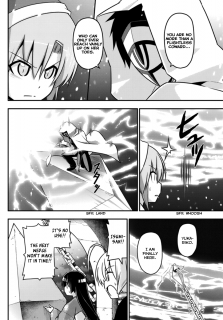 For Hayate, the sinner is getting what he deserves. For Nagi, she’s getting her dream. Hina does not like the talk of Hayate getting the punishment he deserves. When Himegami remarks on Hina being in love with Hayate, Aika confirms this. She then encourages Hina to proceed. Himegami mocks Hina for being afraid of heights. Ginka informs Hina that she has to break Himegami’s mask, which will cause him to be unable to fly. Then she can break the giant container with the King’s Jewel. Himegami proceeds to the final chain wedge to break it, mocking Hina once again. Hina snaps and uses Shirozakura as a flying platform instead of a sword. She then brandishes the bokken (wooden sword) Masamune. Her sky battle is seen by the students below, including Izumi, Miki, and Risa. Ruka plays like this is part of the show for her concert. Hina discovers Himegami has a metal arm, which was given to him by a god. 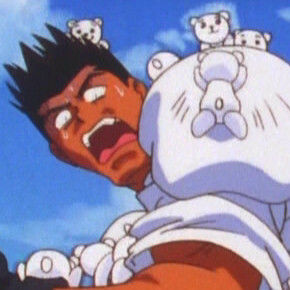 He uses the rocket punch to knock Hina off Shirozakura. Hina panics, but hearing her friends cheer her on, she calls for Shirozakura and lands on it, coming to a stop in front of Ruka on stage. Ruka encourages Hina to keep up the fight, which Hina does. However, Himegami’s Rocket Punch shatters Masamune. Himegami thinks he’s won, but someone appearing to be Yukiji borrows a shinai from Fumi-chan and hurls the bamboo sword to Hina. With that, Hina smashes Himegami’s mask and destroys the container for the King’s Jewel. Sakuya and Athena race to find the King’s Jewel, only to find another surprise. 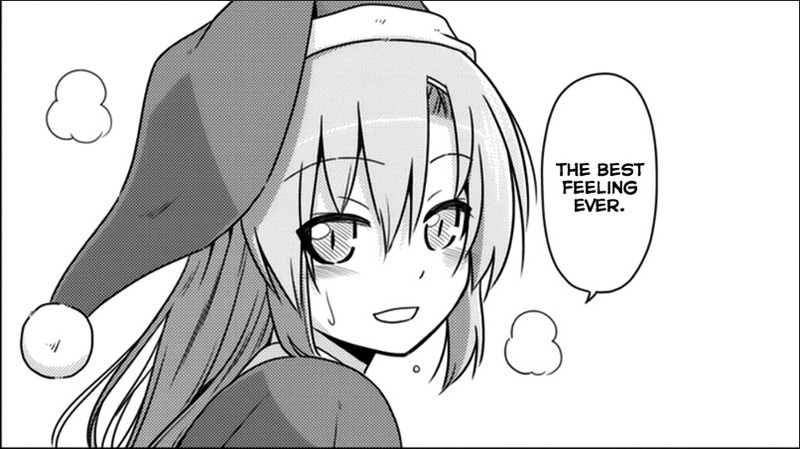 Hayate the Combat Butler chapter 563 is a Hina chapter, which is cool. Just don’t look too deeply at it. When Isumi allowed Hina to borrow the bokken Masamune, I never really questioned Hina being able to summon it at will. I think that’s partially because Hata-sensei did a 4-koma comic strip showing Hina calling for the sword and it responding to her, much to Isumi’s dismay. Plus, there’s also the standing notion in some Japanese titles of being able to summon weapons and such. I think of Erza from Fairy Tail for a start. Unfortunately, because Hata-sensei never really explored Shirozakura, Hina’s mastery of the sword as a flying platform is crap, even though it looks cool. 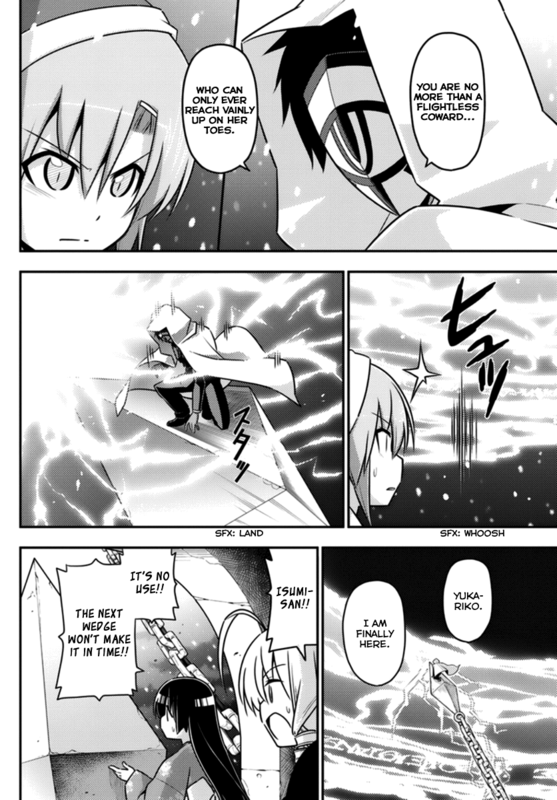 Since it is a named sword, I presume Shirozakura is magical. Ginka is the one who gives it to Hina in the first place. So how does Hina learn that it can fly and she can ride it like a skinny surf board? I keep thinking, “You know Hata-sensei? If you’d just mixed gag while always continuing the plot, maybe we’d KNOW something about Shirozakura!” But alas, we don’t. Despite there being no setup for it, Hina looks cool air-surfing on Shirozakura. Hina overcoming her fear of heights and flying is fun to see. That element was believable. Hina has long been established to have the personality that if you challenge her, she rises to the occasion. So Himegami taunting her and mocking Hayate being the motivation that causes her to overcome her fears made sense to me. It is WAY late and I have to work, so I’ll wrap this up with bullet points. Himegami’s Rocket Punch hand is clearly a nod to Hata-sensei’s Kami-sama ni Rocket Punch!! Since Hata-sensei has linked all of his other works to Hayate the Combat Butler, I guess this means that Himegami is actually Tasuke. Looks like Yukiji makes a comeback to help Hina one final time. I loved that nod. Aika gets a fun moment to push Hina along. Moments like those are proof that Hata-sensei can do gags and push the plot instead of running away from plot for long stretches at a time. With Himegami calling for Yukariko, there’s still a part of me hoping she’s still alive and such. But we’ll see. 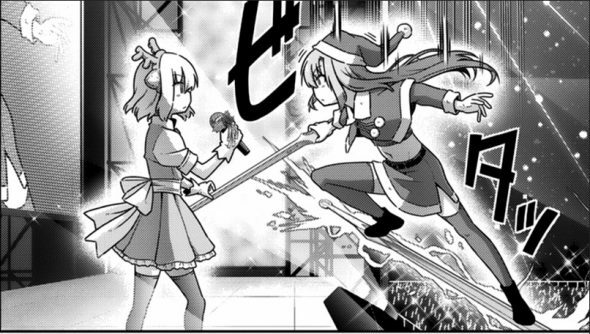 In the end, Hayate the Combat Butler chapter 563 is a fun Hina chapter, providing you don’t ask how she knew she could fly on Shirozakura. Hmm? Flight is pretty much the first thing we see Shirozakura do, though. The sword pulls Hinagiku to the final battle against king Midas as soon as she first takes it into her hands in chapter 258. And in the next chapter, she uses it to fly (willingly this time) up to the monster spawning orb. Now that you mention it, I guess I vaguely recall that. I should go back and reread that stuff. But still, in this chapter, it comes off as out of nowhere. That’s because it has been how many years since we saw that flying scene. Update: Thanks for providing the chapter number. Wow. No wonder I forgot. That’s a long, LONG time ago and I don’t think we’ve seen Shirozakura used for flight since.